Move over, Supergirls. 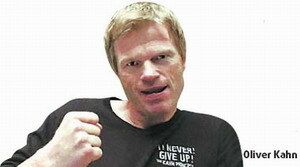 Legendary German footballer Oliver Kahn will launch his own Chinese reality television show tonight, tapping into the nation's passion for the world game. Never Give Up! - The Kahn Principle aims to discover China's best young goalkeeper and the winner will be enrolled at the German Football Association (DFB)'s elite training academy Berger Feld Schule in preparation for a professional career. Although Kahn doesn't expect to pull Supergirls' 280 million viewers, he does hope his 10-part TV series can pass on to local football fans his "never-say-die" attitude, which thrice helped him earn the title of the world's best goalkeeper of the year. The 40-year-old who retired from Bayern Munich only last year, plans to show young Asians the power of motivation and how they can make their dreams come true. And unlike Donald Trump in The Apprentice, he promises to be nice. "We don't want to do an empty and meaningless, mindless casting show. And I don't want to be the one who 'talks big' and disses or offends the young candidates when they don't succeed. The group of young goalkeepers, aged between 17 and 24 and including two women, will be shown the importance of the goalkeeper in the game. Kahn has designed his show to reflect the "importance of individuality and personality but most of all, how the contestants handle defeat". Kahn knows the pain of being beaten. He was voted the best player at the 2002 World Cup, a feat never achieved by a goalkeeper before but in the final, he made a serious mistake, spilling a shot to Brazilian player Ronaldo, who pounced on it and won the game. "Finally, I have become much more stronger from this defeat," he says. "The crises in my life have always been a danger, of course, because there is always the potential that you'll be destroyed. But on the other hand, crises always include an opportunity to learn, to adjust and to re-emerge much stronger." Kahn says Chinese viewers will see how his principles can be adapted to everyday life and how they can be a "roadmap to success". The show airs on Heilongjiang Satellite TV tonight (Thursday) at 22:50.